With the popularity and success of mafia films, lesser known, true stories have to come to light, and I tend to enjoy them the most. Everybody knows about Gotti, Capone, and Bulger, but how many people know about Danny Greene? Greene was a simple factory worker in Cleveland, Ohio, who was upset by how mob corruption had taken over every major industry in the city. Greene wanted to fight back, but no one successfully takes on the mob, so Greene decided to hit them where it hurt. Greene started his own crew and slowly started to take over their businesses. For nearly a decade, the mob tried and failed to assassinate Greene, making him a modern day Bravehart in the hearts and minds of the citizens of Cleveland. Ray Stevenson, always "that other guy", stars in this film, and he was truly outstanding. People who knew Greene say Stevenson's performance was spot on and that really adds to the excitement surrounding this film. 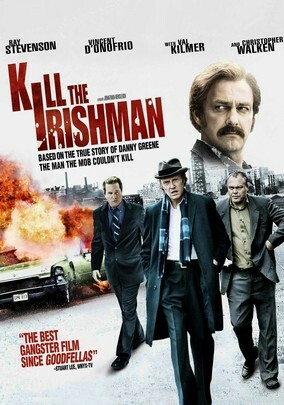 Kill The Irishman isn't without it's problems however, as with most mafia related films, it moves incredibly fast. It's hard to keep track of the timeline and as always, people come and go so quickly, that it's hard to keep track of who is who. Beyond that, this film focuses on the violence and assassination attempts surrounding Greene, rather than simply telling his story. The bottom line, Kill The Irishman is certainly not Goodfellas, but it was still extremely entertaining, and offers viewers a story about the mafia, that most wise guys would prefer to forget.